Ready to make your own natural scene with sweet ingredients? Pick the element you want to create, and let's get started. Lakes, waterfalls, streams, and pools are wonderful design elements for a birthday, anniversary and even retirement-themed cake. Water can be tricky to make well because it is usually in motion and has depths. You can create depth and realism by using both buttercream and piping gel in layers. Start with a blue buttercream as the base of your lake or stream and after it has crusted top it with clear sparkly gel icing with accents of light blue gel. Rapids can be added after your initial layers of buttercream and gel icing have hardened a bit. Simply swirl white buttercream into rapids using a toothpick. "Snow"-covered cupcakes with icicles are a perfect place for fondant penguins to frolic so it is important to make a wonderful backdrop for their play. Ice can be made with piped gel icing in light blue applied directly onto the surface of the white buttercream. Light blue Isomalt can also be melted and cooled in puddles to form the right size frozen ponds or streams. Snow is an easy backdrop to create with any type of white icing. Fluffy Italian meringue, marshmallow buttercream, or plain vanilla buttercream all can be mounded and swirled to reflect a snowy landscape. You can also add desiccated coconut to the surface of your snow if it suits the underlying flavor of the cake or cupcake. These design elements share a common element which is they are all about creating realistic texture. So rather than trying to duplicate tiny specks use real specks that are part of an edible medium. Perfect dirt can be made using fine chocolate cookie crumb such as Oreos. You can mix in lighter brown crumbs by crushing other biscuits and mixing it all together. You can even leave larger uncrushed pieces because real dirt is not uniform or add fondant rocks for effect. Cake decorating sand is a mixture of both golden and granulated sugar dusted and mounded onto your beach cake design. This obviously adds quite a bit of surface sweetness to your cake so take care that your icing is not tooth numbing sweet underneath; try a Swiss meringue or cream cheese icing base. Pretty nature scenes on cakes often feature lush green grass as a base to the design and getting the right look is easy as picking a piping tip. There is a grass tip specifically made for creating grass (and hair) and you simply load the piping bag with the desired hue of green and pipe the grass you require. 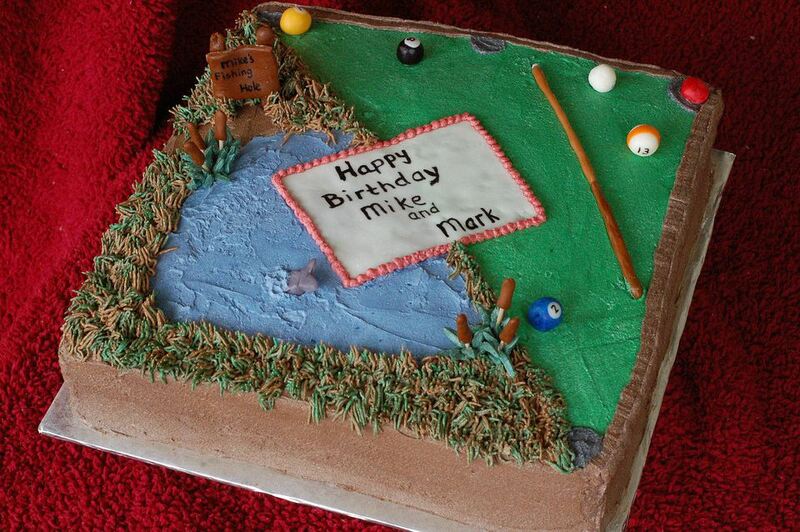 You can also make grass on green fondant by roughing up the fondant surface with either a star tip or comb. This look is not as lush as piped icing but it does look nice. There are several techniques that can be utilized depending on how realistic the fire needs to be in the cake design. If your cake is more stylized or cartoonish then piped buttercream or piping gel can create exactly the look required. Use red, orange and yellow in a fire pattern directly on the cake taking care to look closely at real fire to ascertain the order the colors appear. When in doubt use the darker reds or oranges in the middle to represent the hotter part of the flame and surround it with the cooler yellow gel or icing. Isomalt creates a more translucent realistic looking flame but is tricky to use if you are a beginner designer. Melt small amounts of yellow and red isomalt sticks in separate silicone containers and pour out the yellow onto a parchment covered baking tray in a flame pattern. Pour the red into the center of the yellow design before the yellow has an opportunity to cool. Place the flames on your cake or cupcake when the isomalt has cooled completely.